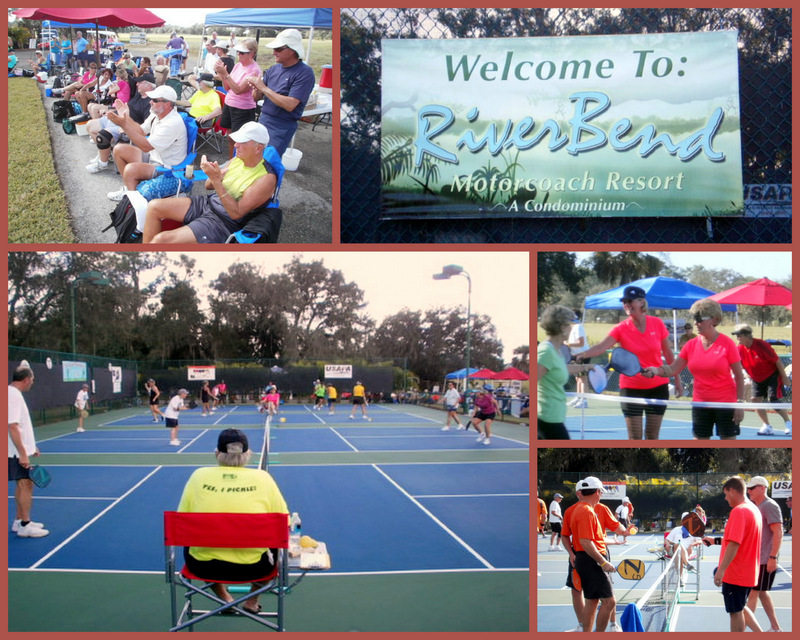 The 2nd Annual Riverbend Classic took place on December 8 and 9, 2013 at the Riverbend Motorcoach Resort in Labelle, Fl. This year the tournament was a Tier 4 USAPA Sanctioned Skill Level event. Tournament directors were Nancy Meyer and Cindy Eddleman, SW Florida Ambassadors from North Ft. Myers. The Riverbend Motorcoach Classic increased participation from 84 last year to 126 this year! The only "glitch" was rain on Saturday afternoon which meant playing more matches on Sunday. Besides the participants, we had many spectators and everyone made new friends and had fun. The Riverbend volunteers turned out in force and worked very hard to make the tournament a huge success. This year, the tournament was sanctioned, and we had referees at each match. Many thanks to all the folks who volunteered to referee matches and a big thank you to the Tanglewood referees who used this tournament as a warm-up for their sanctioned tournament in January. In spite of the rain on Saturday, we think that everyone had fun, made friends and definitely played some great Pickleball!!! Click Here for the photo gallery. Click Here for all the tournament results.